Exciting news for Batman fans, Warner Bros. Home Entertainment will unveil the sequel to their recent animated feature Batman Unlimited: Animal Instincts on Blu-ray Combo Pack and DVD on August 18, 2015. 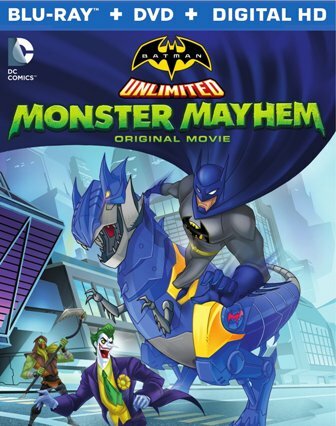 The new film is called Batman Unlimited: Monster Mayhem and it’s designed as a family-friendly alternative to the more mature-themed Batman animated features that Warner Bros. has been releasing (such as the recent PG-13 rated Batman Vs Robin). The Batman Unlimited feature films are based on the currently available toy line of the same name. Batman Unlimited: Monster Mayhem will be available early via the Digital HD format on August 4. Special features included on the Blu-ray and DVD: “GOTHAM 2030: Designing a Future World” – The artistic team responsible for bringing this future Gotham City to life will take you on an exploration of their creative process, from their earliest concept sketches through the final eye-popping landscapes. Welcome to a Gotham City of tomorrow! Stay tuned for further info about the upcoming Batman Unlimited Monster Mayhem closer to the release date. See our review of Batman Unlimited: Animal Instincts.